These new generation of sports anime including Kuroko basketball will inspire many watchers of anime to love, live and enjoy their favorite sport. As for Ace of the Diamond it has shown to be an anime which has potential and could stand the test of time. The first episode had a mix of Friendship, hunger to achieve, loyalty to ones comrades and ultimately to dream. Not a fan of Baseball? Neither was I. But that didn't stop me from absolutely loving this anime. It isn't just about baseball; it's about so much more. That being said, the series has taught me a lot about the game that I never really could understand or appreciate before, and I have a deeper respect for it now. I think that in itself is a great compliment you can give to something; where it changes your opinion on what you previously thought was a boring sport. But besides that, what really makes this show is the character development, story, and execution of that story. The quality of animation, music, and directing really makes this series shine. It feels top notch, you really get into each character and become a fan of the team yourself. In the most recent episodes, the series has really shown itself to go far beyond what I had ever expected; and for that I will say this is now a must watch series. You are going to have a lot of feels watching these characters grow, and you'll never expect where things turn out. I'm excited to see where the series goes, and I can't wait for the new episode each week. It has me totally hooked. I highly recommend checking this out, sports fan or not. Fantastic anime, but more importantly one of the most accurate depictions of baseball in any media I've watched. Having played on a high level American high school baseball team in the past, I'm shocked at how closely Seido's practices (especially all of the running and sprinting) mirror what our team used to do in high school. Even more importantly, as a former pitcher for many years, I'm incredibly happy with the show's depiction of the pitcher-catcher battery, and the strategic mindset. The pitcher-catcher battle with the batter is truly what makes baseball one of the most intense sports to play. Can't wait to the see this show continue to play out! As of episode 18, it's my favorite sports anime of all time! Sawamura's gonna need to learn a change-up pretty soon though, haha. This anime makes Baseball not as boring. The anime has a good flow of intensity to it. It keeps you on the edge of your seat to be frank. I've always thought Baseball was a boring sport so I was a little iffy when I decided to watch it, but I'm glad I did. The plot has all of the good ingredients for a edgy and exciting sports anime. You won't be disappointed with this one. A must watch for every baseball fan! No... Everyone! Well when I started this anime, which was when it was 8 episodes in, I didn't expect much. Just this baseball anime with cool animation. I have never been so wrong in my life. This anime is thrilling, competitive, and non-stop (baseball) action! Each week I am left with despair, however, as I must wait for the next episode for an ENTIRE WEEK. Pretty painful. 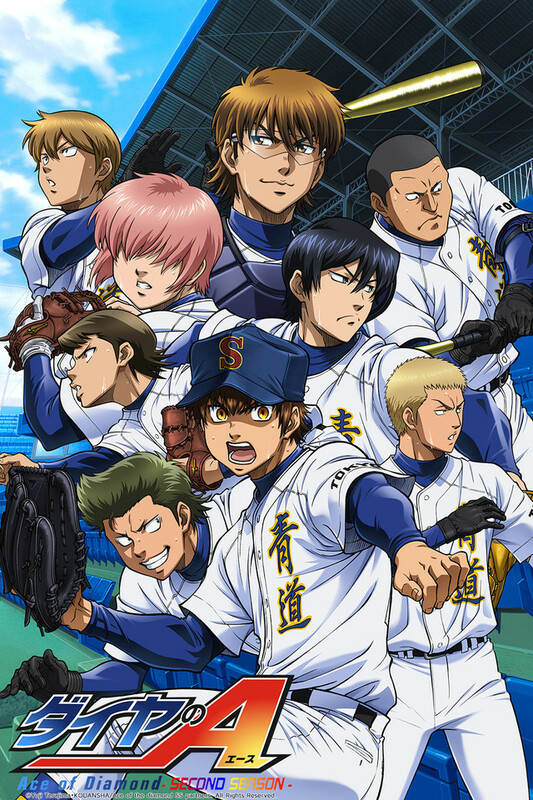 Regardless, I recommend this anime to everyone, baseball fan or not, sports anime fan or not. You will definitely enjoy it, or at least get a good laugh at Sawamura's (the main character) stupidity. If you are really into sport's anime then jump right in and give this one a look! I'm very 50/50 on Ace of Diamond's its well drawn and there are some very lovable characters however... The pacing is super slow and the "MC" just seems to kinda to fade away as more and more time goes on. This series starts off a little slowly and a bit differently from your typical sports anime, but the excitement and competition ramp up like crazy soon enough! What sets "Daiya no Ace" apart from other baseball anime is that, usually, the heroes are a small underdog team that takes down the big teams that dominate Koushien. But this time, DnA is about one of those big, elite teams, and the excitement comes from the competition within the team to get one of the 9 spots on the first-string starting team. This allows for an unprecedented level of individual rivalry (which, c'mon, is the best part of sports anime~). Our hero Sawamura is a diamond-in-the-rough pitcher with a lot of promise but no proper training. He is lured away from his close-knit (if bumbling) team out in the countryside to Seido High's elite baseball team by the charismatic prodigy catcher Miyuki, whose insightful strategies and ability to draw out pitchers' potential have made him the starting catcher on the first-string after only one year on the team. Miyuki sees massive potential in Sawamura and it seems a perfect battery is on its way to being formed--until the appearance of another first-year pitcher, Furuya, whose quiet personality belies a monstrous strength. For years, Furuya's pitches have been so powerful that no catcher has been able to catch them (which is why no one had heard of Furuya's insane ability--he was never allowed to play since no one could catch his pitches). He came all the way to Seido from Hokkaido in the hopes that he'd finally meet a catcher who could catch his pitches and Miyuki does not disappoint. As a result, our two talented first-year pitchers are in competition for their catcher, in addition to facing the many challenges (hazing, politics, traditions, etc) of breaking in to such an elite, historied team. That said, the high energy, comedy, rich character drama, and Sawamura's infectious optimism and disarming kindness make this a very watchable journey, with many interesting characters and some very exciting matches even within the first 13 episodes. Definitely worth the watch, whether you're a sports anime fan or general shonen anime fan. Check it out! This anime starts of really great but after 60 episodes the show becomes long winded. Likable characters disappear and are replaced by new characters which don't have much to them. They bring nothing new and it makes the anime stale after a while. That said the animation is excellent and it should be a given when Mad House is on the case. I'm going to be the Ace! Starting from the first couple episodes you know this anime is going to be a feels trip. Amazing story that takes you deep into the heart of each individual player on the team. Story can be slow at times but it keeps you on the edge of your seat. Who knew baseball could be this entertaining. Watching this anime series is definitely time well spent! I'm an MLB fan and I find this anime a good reflection of Japanese baseball compared to Major. It's more realistic to see an Eijun than Goro in the MLB. Anyway, as I watch the anime in progress, I appreciate how the role of other players are shown. In MLB or baseball in general, pitchers wont be able to do many feats without the support of his fielders. Take for example Yadi Molina (StL) and Buster Posey (SF), the success of their pitchers are based on their game calls and pitch out plays. Miyuki Kazuya sure does a good job drawing out all the pitchers' potentials while on the mound. The superb plays of the seniors in Seidoh is a classic example of paid off hard work. All players entering MLB are outstanding players in the minors yet they had to go through secondary priority, lots of training, losses, injuries and boos before earning their rightful places as starting member. MC Eijun Sawamura had to go through a lot before earning his place and it takes time, especially that he has a formidable rival within his team. Of course, I would understand coach kataoka not making him as starter because his role doesn't fit him currently. Mariano Rivera is one one of Yankees all time best pitchers, not as a starter but a closer. With over 50 episodes and over 390 chapters, it may seem that the mangaka is making Eijun suffer so much. I'm not sure about the author's intention but I would be very surprised if he becomes the ace given the fact that he's still polishing his skills and there are Furuya and Kawakami who can pitch like him. The take for example Adam wainwright, during his minors, he was always the starter. When he stepped up in the big leagues, he had to go through being reliever, closer then eventually the ace. It took him at least 7 years before he Became the Ace of Cardinals. Of course, HS baseball is much shorter, but given only five months in the entire timeline of the manga, it is but proper that Eijun has his current order as mid reliever. If he were real, he needs another six full months to master his signature pitches. Well, their former ace Tanba took three years and two potential pitchers to compete before he finally understand what is meant to be an ace. BUT HE IS THE MAIN CHARACTER! Yeah obviously, but I don't want to watch another Goro Shigeno in a different anime. We're done with the "only pitcher in team" story-line. Hey, I love Major and have watched it until the end. Let's be patient with Eijun and try to study how baseball really works, you will appreciate DnA more than ever. Baseball terms and plays both offensive and defensive, it's worth researching. Collective skills and talents properly sorted to players not only of Seidoh but also of their opponents. The feels of each team's struggles to win. Individual talents such as Miyuki Kazuya, Mei Narumiya, Yuki Tetsuya, Kominato Haruichi, and many more. Hey, DnA is also promoting Mizuno brand.